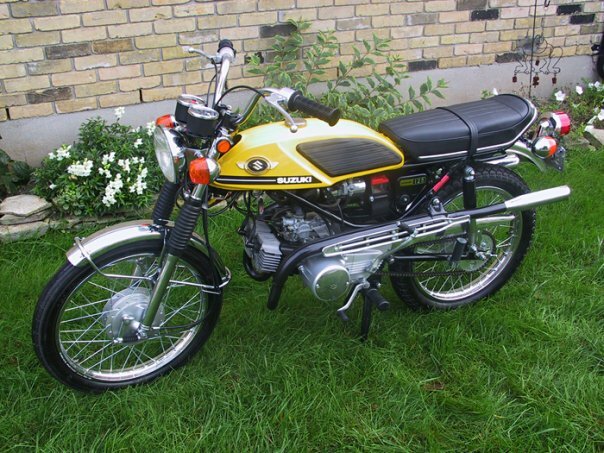 Diablo Cycle transforms this 1970 Suzuki T125 from junk to a gem. This page is to document the restoration of our Stinger II. These are becoming increasingly difficult to find and almost as hard to find parts for. We'll take you through the restoration with pictures, comments and information. 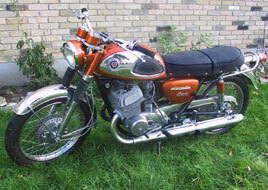 Hopefully this will show you that it is not as hard as you may think to restore a vintage Japanese motorcycle. After a searching for some time, we found a rough but restorable Stinger. Locating one here in Canada proved to be more challenging than we expected. 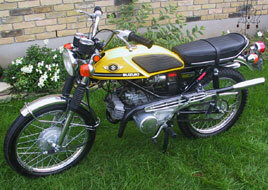 This example was found close to home by my friend Bill Coulson, a fellow Suzuki enthusiast. Although it wasn't much to look at, a couple of hours spent cleaning the carbs, checking the points and replacing the spark plugs had it running beautifully. One kick and it would start every time and idle smoothly. See the green paint showing through the gray? I like to determine the mechanical condition of a project before tear down if possible. This avoids a lot of work and potential damage to freshly painted or polished parts after the bike has been reassembled. The carbs were fairly clean inside. A good sign! In spite of being a good runner, this motor needs some TLC. Over thirty years of rust, corrosion and grime must be removed. I had to disassemble most of the motor to do so. Because it runs so well and there is no indication of problems the cases were not split. Another picture to illustrate exactly what we were up against. Lots of grime with cables and wires that seem to be routed incorrectly. 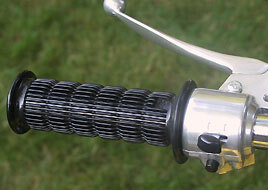 I take lots of pictures to help route them correctly when the bike goes back together, but these were not of much use. The front forks were okay once they were cleaned up and new seals installed. The rear shocks were not. These had to be replaced. Fortunately a set of NOS shocks were located. Here is the right side engine cover. The pictures don't show how badly gouged they were from a previous mishap. 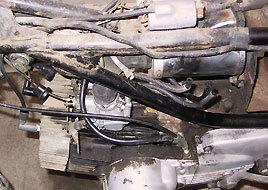 The oil lines were so brittle from age, two of them broke while trying to remove them. 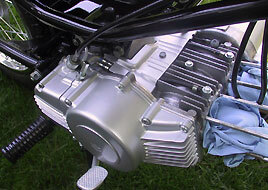 As you can see, the crank cases are now clean and the covers look like new. All road rash has been repaired and repainted. 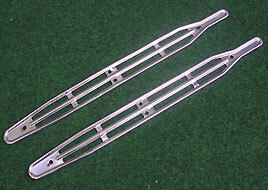 The oil lines replaced with new ones, thanks to my good friend Paul Miller of Paul Miller Motorcycle. I have skipped over the installation of the motor. It is now back in the freshly painted frame and the wiring is well underway. This is also a good time to run cables and oil pump lines. I couldn't resist putting on the tank and seat to see how it looks. It also gives the illusion of being further along than I really was. After hours of cleaning the crank case it looks like new. I used solvents and a parts washing brush. Some tight places required a toothbrush. The T125 cases have fins which make this job a little more work but it was worth the effort. 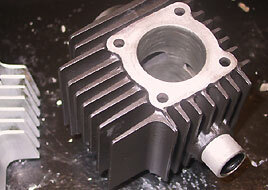 While the cylinders were off, I honed the bores and replaced the rings. New head and base gaskets were used. The old rings were still well within acceptable tolerances, but piston rings are not expensive. 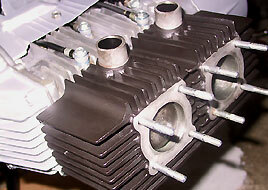 With the cylinders in place, the next step is to put the cylinder heads back in place. Before installing them, I checked for cracks and lightly resurfaced them to ensure they were not warped. 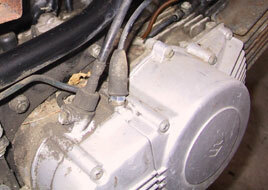 With the cylinders and heads on, I was able to put on the carburetors and route all of the cables. 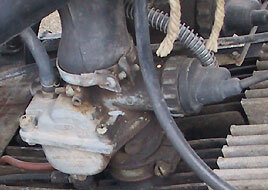 It is a good time to set up the carbs while the area is less cluttered with hoses and the exhaust pipes. Don't leave this job until the end. Most of the wiring is now complete and some of the small details such as decals can be added. 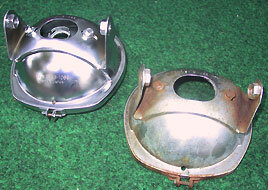 If you are doing a full restoration, you will want to replace the oil level inspection lens. They often discolor and even crack over time. All cables were replaced as well as the right and left switch assemblies. The hand grips were also replaced. Running the switch wires through the handlebars required some patience. 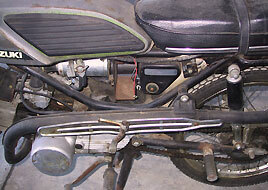 New handlebars and bolts were used on the front end. 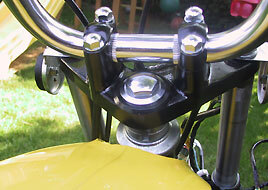 The clamps and upper steering stem head were glass beaded and painted black. 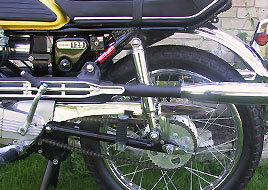 The handlebars are the optional "western" handlebar that has no cross brace. The tank was repainted by Paul Miller in yellow. 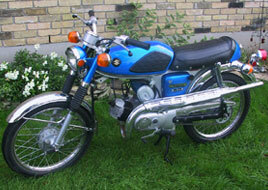 This was an optional color seldom seen on this model. It was offered in "pop green" & "candy yellow" in 1970 as well. We also have a freshly painted green tank but I prefer the yellow. The badges are items that we stock. Another gem from Paul Miller. 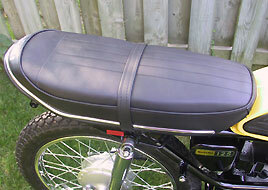 This seat cover is an "exact" reproduction of the original, right down to the heat pressed seams. This one item can make or break your Stinger restoration. 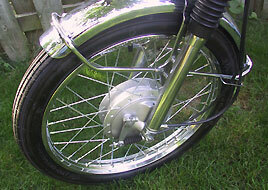 The front fender is NOS as are the complete front and and back wheels. No need to mention where these came from right? 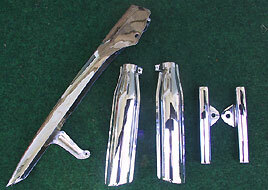 The original fork boots were in perfect condition and reused. 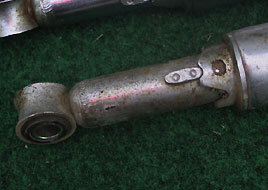 Not many parts from the original bike were. 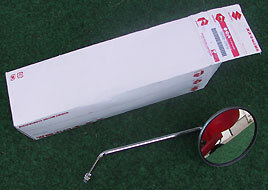 The original headlight assembly was bent and badly rusted. It was replaced with NOS pieces. Repairing and rechroming them was not worth it. 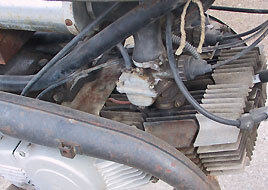 The the exhaust heat shields are a mix of NOS and original. The original one has since been straightened and cleaned up so well that you would have to look very close to know which it is. When it's all done, there are a set of NOS mirrors waiting to be installed. The parts are back from being rechromed and look great! Better than new but reputable chrome shops will not duplicate the poor quality plating that was originally on these parts. A picture of the back of the bike. 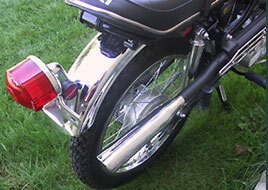 The rear fender was rechromed as well and the tail light assembly is mounted. New gearbox oil and some gas and our T125 fired up and ran but not well. I discovered by connecting a battery that I had around the shop that the left cylinder gets a really weak spark without a battery connected. 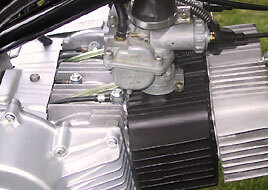 Once a battery was connected, both cylinders fired right up and our bike runs great. Finished at last! Our Stinger looks as good as the day it rolled off the assembly line. It runs as good as it looks and riding it is loads of fun. Another big thanks goes to my good friend Paul Miller. 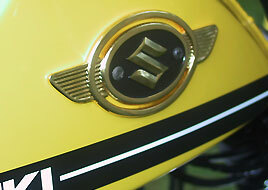 He supplied most of the the parts and his knowledge of all things Suzuki was invaluable throughout the restoration. This bike is now a permanent part of our collection. 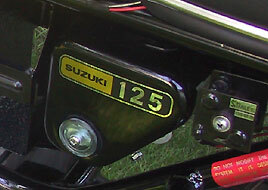 Here are some of our other Suzuki restorations. 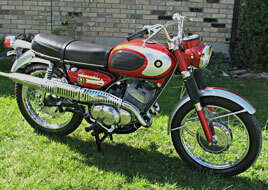 Our 1968 T500 Cobra also came to us as a complete bike. This one ran but the motor was completely rebuilt. It was disassembled to restore and spent about 5 years in boxes. When all of the parts to complete it were collected, it didn't take long to assemble this very nice early T500. Restoration was completed in 2004. 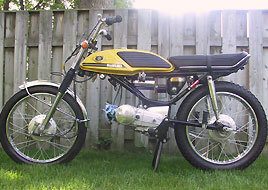 Our 1968 TC250 Scrambler, also known as the X6 or Super Six. From boxes of rusty parts to a beauty, this early example of a dual purpose bike is now a permanent part of our collection. 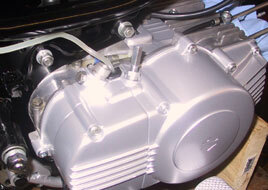 This 1969 AS50 Colt was completed early in 2005. It was in rough condition but relatively complete. 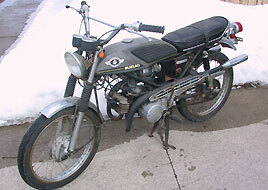 A good friend Gerald, known to some as "Suzuki Canada" knew I wanted it. A deal was eventually struck and I got a project bike and he now has carbon fiber exhaust for his Katana. Little did I know how tough it is to find certain parts for this model. It was well worth the effort.